San Francisco, CA (Feb. 19, 2013) – Anchor Brewing, the City’s largest manufacturer, today joined Mayor Edwin Lee and the San Francisco Giants to announce plans to construct a world-class facility at Pier 48 as part of the Mission Rock Development Project. Anchor will continue to operate its facility in Potrero Hill, but will greatly expand its operations with the development of the Pier 48 facility. The two facilities will allow the historic American brewery to quadruple its annual production capacity from 180,000 barrels to 680,000 barrels. Pier 48, the southern-most structure of the Port’s Embarcadero Historic District, will be fully rehabilitated and re-established as an industrial hub of the central waterfront. The new Anchor facility will feature production facilities for brewing, distilling, packaging, storing, and shipping; a restaurant, museum and educational facility in the headhouse of Pier 48; and a restored walkway around the entire pier apron that will connect pedestrians to the Portwalk and allow views into the Anchor brewhouse. Anchor will offer tours of the facilities and educational seminars with a focus on the history of craft beer, the art of craft distilling and Anchor’s history in San Francisco. The construction project beginning late 2014 will feature the use of green and sustainable materials, setting the standard for a modern urban brewery. The Anchor expansion will create approximately 200 new jobs, 75% of which are production-oriented positions that employ a diverse work force. 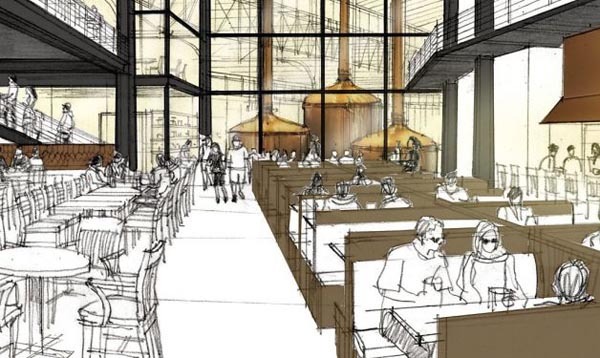 The Anchor Brewery expansion project also represents the first major tenant of the Mission Rock Project – a new, mixed use urban neighborhood currently being developed by the San Francisco Giants. The Anchor Brewing facility will cover 22% of the overall project site. In addition to Anchor Brewing’s new facility, the Mission Rock Project will include more than eight acres of parks and open space, 650-1,500 residential units, 1-1.7 million square feet office space, parking structure to serve ballpark and Mission Rock patrons, and up to 250,000 square feet of retail, restaurants, and public amenities. In total, Mission Rock is expected to create 4,800 construction jobs and 6,400 permanent jobs. The Mission Rock Project is one of several development projects on Port Property. The Port of San Francisco, which will celebrate its 150th anniversary in April, is currently implementing a long range master plan which focuses on expanded maritime use and increasing public access to the City’s historic waterfront.